Is There Such a Thing as a Dream House? I ponder this question all the time…. And I can tell you from my experience as a real estate professional, whether a house is priced at $500,000 or $5,000,000, buyers seldom view a house as their “dream house.” A testament to this is a newly-constructed home that sold in Weston, MA a few years ago for more than $6 million. At this price, you would think that the house would have been perfect – a real dream house. But the week after it sold, there were a multitude of contractors’ trucks parked on the street. They were doing work on the house, and they were there for months. Wow….. I share this story with my clients because I think it is important information for them to have. The truth is, for the most part, a home is not going to satisfy everything you want in a house – no matter what the price point. For example, the street may be busier than you like, the house may need more updating than you want or can afford to do, and/or there may not be a garage. So it’s really about prioritizing and potentially compromising. It’s about understanding what you can and can’t live with. And also realizing that if you are waiting for your perfect, dream house, you could be waiting a long, long time. I know that sounds a little negative – especially from someone who aspires to sell clients their perfect, dream houses over and over again. But I have a different perspective when I think of my own life. In the early 1990s, my father bought a Sea Captain’s house built in the early 1800s in Nantucket. This was the house of my dreams – and still is, in fact. It was filled with charm and personality (a fireplace in every room on the first two floors), it had six well-sized bedrooms and could comfortably sleep 13 people. It was located a stone’s throw from the center of town, and it had a private, gorgeous backyard which is almost impossible to find in the heart of Nantucket town. We all loved the house and shared so many happy times there – countless birthday celebrations, wedding events, Thanksgiving dinners, family croquet tournaments. We filled the house with such joyful memories. Did it matter that the bathrooms were not updated, that the laundry room was in the basement or that the garage was detached? Not a bit. We looked past those imperfections because the home held a special place in each of our hearts – we truly loved the house. It was our dream home! So when I think of this, then my answer is YES; of course there is such thing as a dream house. It really just comes down to your state of mind…looking past some of the home’s features that perhaps may not be ideal and focusing on the broader picture – the memories and joyous times that the house provides for you when sharing life with family and friends. And so ultimately what I’ve decided is that yes, there is such thing as a dream house. But is it perfect in every way? Not at all…which is completely okay and to be expected! 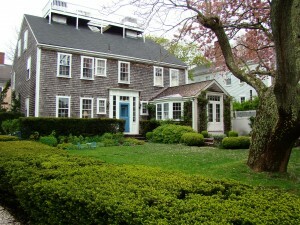 With all of this said, I wanted to share with you a few pictures of my dream house*, 6 Darling Street, Nantucket, MA lovingly owned by the Jack Curlett family from 1991 – 2011….. Cheers!